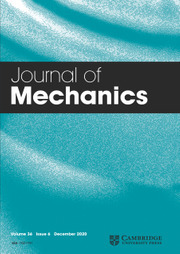 The Journal of Mechanics publishes original research in all fields of theoretical and applied solid/ fluid mechanics. The Journal aims to serve as an international forum for the exchange of ideas among mechanics communities around the world. The Journal of Mechanics especially welcomes papers that are related to recent technological advances, such as micro/nanomechanics, multi-scale computational methods, and design on simulation technology. The contributions, which may be analytical, numerical or semi-empirical, should be of significance to the progress of mechanics. Papers which are primarily illustrations of established principles and procedures will generally not be accepted. Reports that are of technical interest are published as Short articles, and Review articles are published only by invitation.